Celebrate the origins of America with a fascinating and purely entertaining visit to the Roanoke Island Festival Park. This 25-acre historic site, an easy stroll from the downtown Manteo waterfront, is a popular summer attraction for visitors of all ages. With four distinct attractions that wind through the wooded and grassy regions bordering the Roanoke Sound and Shallowbag Bay, patrons will find acres of history to explore, and plenty of engrossing hands-on exhibits to keep everyone purely entertained. Take a whirlwind adventure back in time to the late 1500s without every stepping outside of picturesque Manteo, and plan a visit to Roanoke Island Festival Park for an in-depth introduction to America's roots that feels more like a walk in the park. This beloved Outer Banks attraction celebrates the first English colonies on North American soil. While many folks mistakenly believe that Jamestown was America's first settlement, that honor actually goes to tiny Roanoke Island, which was settled 23 years before the Jamestown settlers even arrived. Granted, the Roanoke Island settlements struggled a lot more and had much less overall success than their Jamestown counterpart. The first settlement, which landed in 1584, was all but disbanded after relations with the local Native Americans began to turn hostile, while the next settlement, arriving in 1587, were the colonists of the notorious Lost Colony, who disappeared from the face of the earth entirely just two years after landing. Despite clear early obstacles, the Roanoke Island colonies had their successes in other ways. Local Native American Chiefs Manteo and Wanchese made good-faith pilgrimages to England, the first English child, Virginia Dare, was born on American soil, and Roanoke Island paved the way for countless more settlements that popped up all along the coast, from Jamestown to Plymouth, MA. The history may be a little stormy, but the Roanoke Island settlement will always hold the honor of being the first North American settlement, and it's a fact that locals take a lot of pride in. The Roanoke Island Festival Park pays homage to this history, and allows visitors to get a glimpse of the conditions these pioneers lived in more than four centuries ago. Bring along a sense of adventure, and enjoy a little time travel for a complete portrait of the early American experience, from the long journey aboard the Elizabeth II to the completed new settlement. 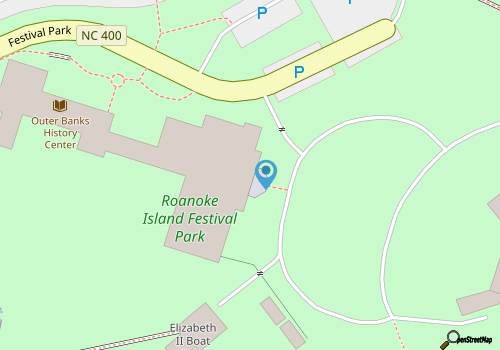 Roanoke Island Festival Park is essentially its own island, covering 25 acres of secluded Manteo that borders the water, and features small thickets of maritime forests, lowlands, and even wetlands throughout the site. The easiest way to access the Roanoke Island Festival Park is to travel across the small wooden bridge which crosses over the harbor. Finding this boardwalk and the park's entrance is an easy task – simply look for the 16th century sailing ship docked at the western end of the harbor. Once your cross the bridge, free parking is available to the left. Roanoke Island Festival Park is open for the majority of the year, generally from March 8 - December 31 from 9:00 a.m. until 5:00 p.m. during the summer, and admission prices are generally $10 for adults, $7 for kids under age 17, and free for children 5 and under. The admission ticket is good for two consecutive days at the park, so visitors who aren't able to squeeze everything in can simply come back the next way for a second tour. Frequent visitors and history buffs may want to consider joining the Friends of Elizabeth II Club, a program which provides free tickets for an entire year, 15% discounts at the museum store, and admittance to many of the park's seasonal programs for kids and adults alike. Coupons are sometimes available on the Roanoke Island Festival Park's website as well, so budget-savvy vacationers should take a peek before they arrive for an even better rate on a local time-travelling trip to the late 1500s. Once you're within the park, visit the Ticket Sales venue and start your adventure. Guests are encouraged to visit the outdoor attractions first. Follow the path down to American Indian Town, the Elizabeth II and Settlement Site. After exploring those attractions, travel back to the main porch visit the indoor attractions, including the Legend of Two Path film, Adventure Museum and Museum Stores. The most noticeable attraction at the Roanoke Island Festival Park is the Elizabeth II, a late 1500s sailing ship that sticks out like a sore thumb on the Manteo waterfront with its wooden exterior, tall sails, and Tudor-era flags. 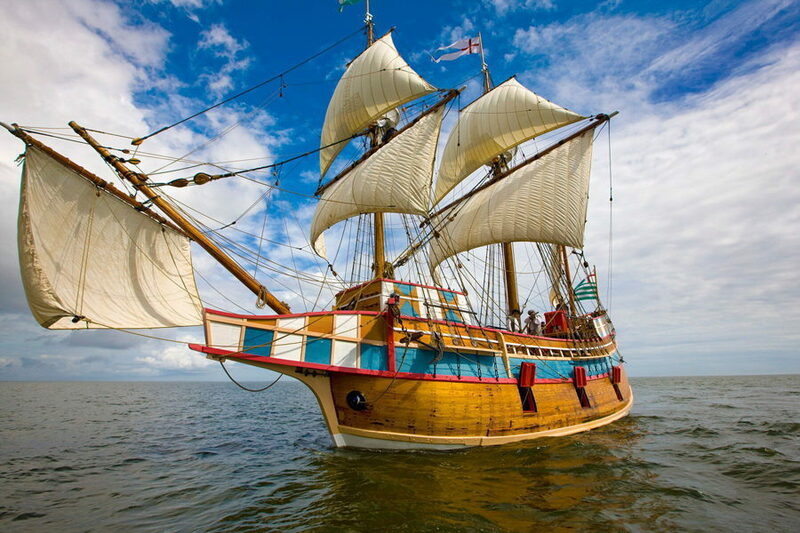 The ship can be admired from almost every downtown Manteo vantage point, but Roanoke Island Festival Park ticket holders can climb aboard and enjoy a tour though a representative 16th century ship that were used to haul colonists, goods and supplies thousands of miles across the ocean. Settlers were on board for months at a time during their voyage, and no detail of that trip has been overlooked from the tiny feather and straw mattresses to the boxes of cargo that were being brought along for a new life in the new World. Costumed interpreters of all varieties are stationed throughout the ship, from lowly crewmen who have nothing better to do than to swab decks or play checkers, to distinguished captains who are plotting a route to or from England. Visitors will find these crew members eager to engage along their exploration of the ship, and may even be roped into rigging the sails, plotting a course, or sitting down for a game. Be sure and engage and ask questions – the crew members here love visitors and are happy to share everything they know about the long journey from Europe to their new Roanoke Island home. Visitors will find the English settlement by following the sounds of the blacksmith's hammer in the background. In a clearing along the maritime forest is a collection of canvassed tents and roughly made cottages, where the sailors and soldiers of the 1585 settlement are waiting to introduce visitors to their world. The 1585 settlement was a purely military and scouting settlement, set up to establish the wild Roanoke Island area and make it safe for colonies that contained more of the general population. As such, visitors will notice the area is crowded with sailors and soldiers, hard at work crafting tools or even weapons, or gearing up in case of a hostile attack from the natives. At this site, newcomers can fall right in and try on some 16th century armor, practice their English accents, or help costumed interpreters lay the canvas over a new tent for storage or even housing. Discover a soldier's everyday dwelling with a straw mattress, play some Elizabethan era games to pass the time, or warm up in the off-season near the soldiers' campfire. This interactive town is filled with activities for visitors, including woodworking stations, blacksmithing and more. It paints an accurate portrait of America's first colonists as they slowly built a settlement, and immersed themselves in their new surroundings. 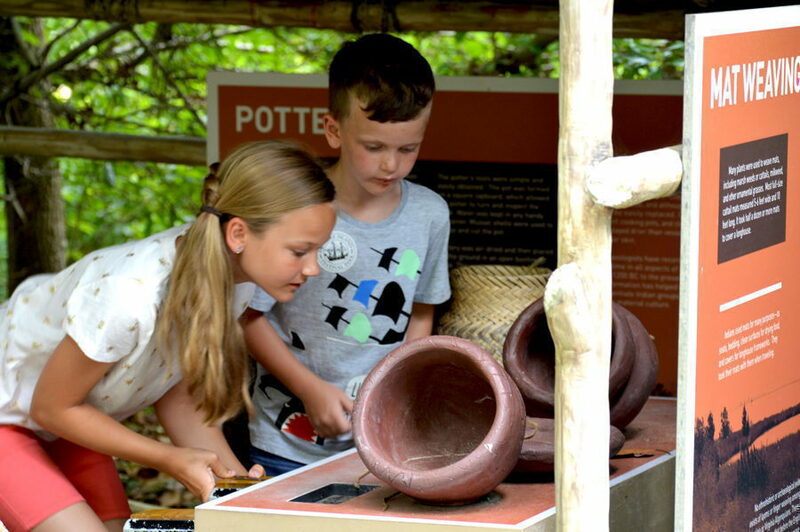 The newest attraction in the Roanoke Island Festival Park is the American Indian Town, a small community that represents the homes and work areas that 1585 settlers spotted when they encountered a local Roanoke Island settlement. The area Native American communities were minor branches of the Algonquins, and visitors can explore two longhouses which represent the original homes of these Outer Banks residents. One of these longhouses is a replica of a typical native home during the Elizabethan era, while the other 30' foot long dwelling marks the home of a community leader, and features exhibits of the notable leaders that called the Outer Banks home. Both areas feature interactive exhibits which chronicles the relations and growing tensions of the natives and the English, and a ceremonial dance circle is also located nearby which features periodic displays to the delight of visitors. In addition to the town itself, visitors will also be able to learn some of the native's daily operations, from traditional farming techniques to mat, rope and basket weaving. Create a hand-made souvenir to take home, or simply enjoy the quiet settlement and marvel at how well the natives lived off the tumultuous Outer Banks landscape. The Roanoke Adventure Museum puts all the other puzzle pieces – the Elizabeth II, the Indian Town and the Settlement Site – into place, with a series of exhibits chronicling the settler's early roots and development. 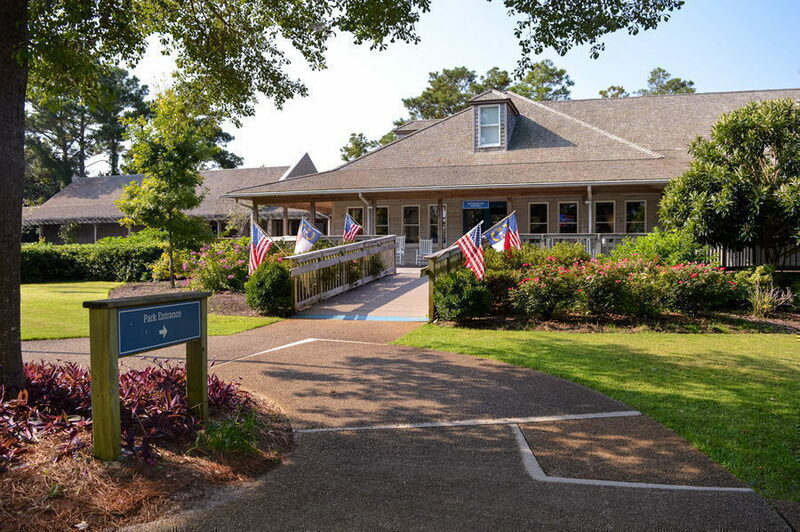 The exhibits highlight the area's history right up to the 20th century, and visitors can explore at their leisure, touring each era and obtaining a complete portrait of Roanoke Island and the Outer Banks' rich history. 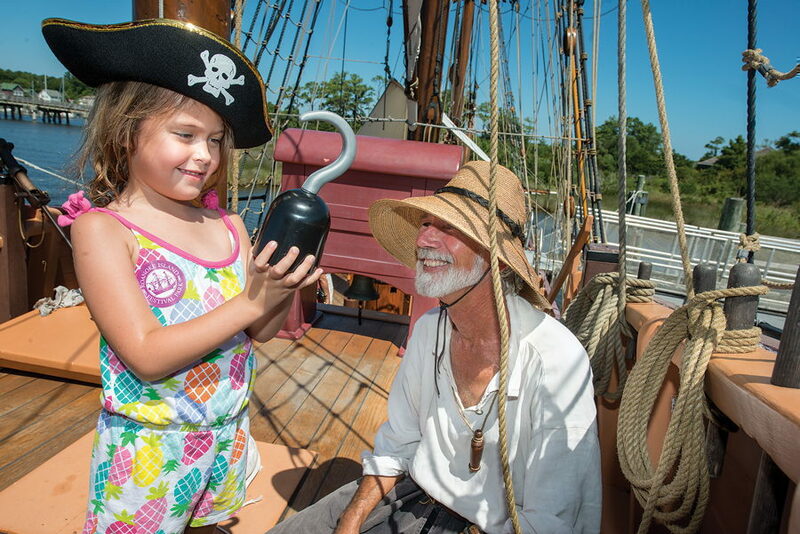 Naturally, as a part of the Roanoke Island Festival Park, there are interactive avenues to explore, and young visitors can dress up in children's costumes, read from Thomas Hariot's journal, or plot a course with a 16th century astrolabe. Nearby is the Museum Store, which is home to a collection of gifts, collectables, books and even clothing paying homage to the park and to 16th century American life. History lovers will have a fun time exploring the many books and music selections, while kids will find plenty of Tudor-era games to enjoy on the car ride back home. Have fun exploring and be sure and take a few treasures back with you as unique gifts or personal mementos of a full day exploring Roanoke Island. Visitors who really want to dig deep into the Outer Banks' astounding stories over the last 400+ years should make a trip to the Outer Banks History Center, which is also located on the premises of the Roanoke Island Festival Park. The History Center has an extensive research library and an equally impressive collection of archived documents, journals, maps, pictures, and other materials that provide a personal first-hand perspective to life on the Outer Banks over the last four centuries. The center has effectively been an instrumental resource to historians and journalists from around the country, and estimates that they field between 3,000 and 4,000 requests every year to leaf through their library and archives. The History Channel, Weather Channel, and National Public Radios (NPR) are all frequent visitors and have used information they found at this center as fodder for national broadcasts and stories. The contents of the library are managed by the North Carolina State Archives and are best accessed by appointment by calling 252-473-2655. From that initial waterfront boardwalk stroll into the park's grounds, visitors will find themselves completely immersed in perfectly serene natural surroundings, from the deep woods that border the American Indian Town settlement to the bay front waters that keep the Elizabeth II afloat. As a result, nature lovers will find a visit to the park a relaxing and enjoyable endeavor, beginning with the tenderly landscaped flower beds along the park's entrance to secluded boardwalks and waterfront docks that are located within the park's interior. The borders of the park are often lined with walking trails or wooden walkways, including a far-reaching boardwalk that hovers above the open Roanoke Sound waters. This boardwalk spans the majority of the park and gives wildlife lovers and birders a fantastic location to spot ibises and herons popping out of the marshy grasses, and walkers and joggers a scenic route of Manteo to explore. The small docks located throughout the park are also ideal locales to pull up a lawn chair or a beach blanket, and simply lean back and enjoy the view. These locales are often prime spots for watching local and visiting boats skirt in and out of the harbor, and visitors are encouraged to bring a camera along to capture the busy Manteo scene. Whether your outdoor interests lean towards fitness, bird watching, or just relaxing and watching the water, Roanoke Island Festival Park is clearly more than a local attraction, it also doubles as a quiet place to get away from it all. 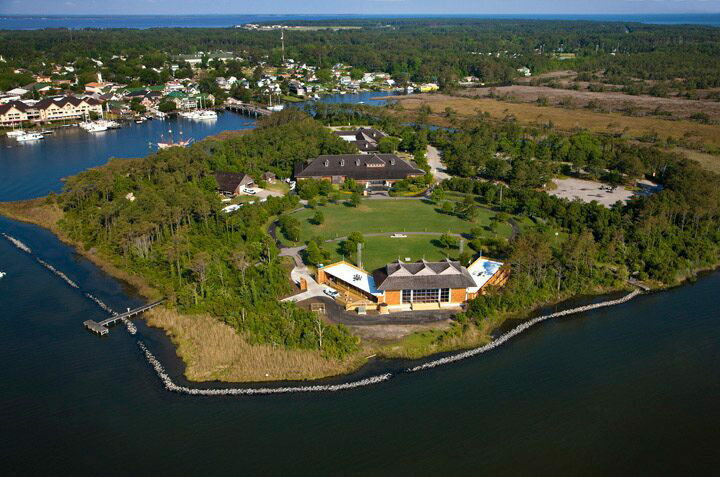 Because of the sheer expanse of Roanoke Island Festival Park, visitors who are interested in hosting a wedding, reception, business retreat or meeting, or an all-out family reunion will find they have plenty of locales and options to consider. Roanoke Island Festival Park has a number of both indoor and outdoor sites that are available for rent, including the large Pavilion Grounds for huge outdoor affairs, a covered Outdoor Pavilion for larger receptions or parties, and a Grand Mall for sit-down dinners or more formal events. Corporate parties may be interested in the meeting room or small auditorium for scenic retreats, and even the Elizabeth II can be rented for a special event of any occasion. Reservations for events must be booked well in advance online or by calling (252) 475-1500. A special event representative is available throughout most of the year to guide visitors on the different locales available and to assist with finding the perfect location for virtually any type of celebration. Roanoke Island Festival Park is also home to a number of special performances,concerts, and seasonal programs that are wide open to the public. 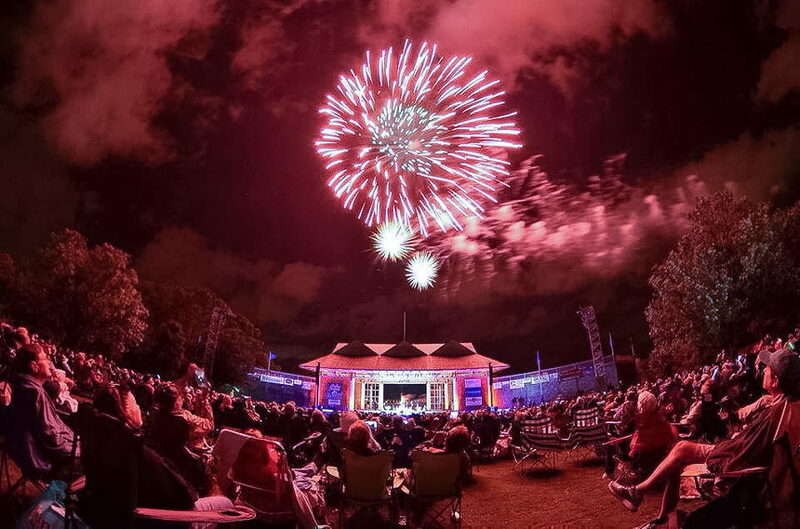 Seasonal visitors can enjoy a phenomenal concert like the annual three-day Bluegrass Festival in May and summer concerts hosted by His Generation. In addition, the park is home to a number of theater productions and Children’s Shows that are aimed to entertain the youngest visitors, like performances of Charlotte's Web. The shows and performances vary every year, so interested patrons are advised to keep an eye on the park's calendar of events to see what upcoming events are coming to Roanoke Island. Once you drive to the park's entrance and have had a chance to navigate through downtown Manteo, you'll most likely want to turn your Roanoke Island Festival Park exploration into a full day trip of exploring Roanoke Island. The island may be located a distance away the popular beaches, but it features the majority of the Outer Banks' attractions, including the North Carolina Aquarium, the Elizabethan Gardens, Roanoke Marshes Light, and of course downtown Manteo. Take your time exploring the sites, especially in the summer when the miles of roadside Crepe Myrtles are in full bloom, and have fun discovering one of the Outer Banks' best off-the-beach regions. In that vein, Outer Banks visitors who are in search of a quick weekend getaway that is filled with local attractions should look into reserving a hotel or Bed and Breakfast in Manteo. Roanoke Island Festival Park borders some of the area's most acclaimed restaurants, in addition to a selection of Bed and Breakfasts that are picturesque retreats with wide shaded porches and beautifully landscaped lawns. For a romantic retreat on the Outer Banks, or a historical tour that covers all of Roanoke Island's highlights, a long weekend Manteo trip near Roanoke Island Festival Park will surely lull anyone into a vacation state of mind. Come prepared for a Roanoke Island Festival Park trip and be sure and wear comfortable clothes and sneakers. At 25 acres, exploring the park is a full afternoon affair, and comfort is key for navigating the different area attractions. A little sunscreen and bug spray will also come in handy for the sunny, (and occasionally buggy), Outer Banks environment. Most important, let your imaginations go wild, and make sure you join in the fun. The costumed interpreters and staff members at the Settlement Site, the Elizabeth II and the American Indian Town are there to answer all questions and engage visitors into fun and educational activities that will only enhance their experience. Get hands-on and encourage the youngest members of your party to do the same, and you'll enjoy your Roanoke Island Festival Park visit to the fullest. The Roanoke Island Festival Park is an incredible local attraction that serves as a historical tour, a gorgeous series of nature trails, a historical archive, and a platform for some of the Outer Banks' best seasonal shows. It's no wonder that with these credentials in tow, the park has been welcoming thousands of vacationers every year for a world of activities that pays homage to America's hardy and at times stormy past. Bring the kids and plan a day trip to Manteo to explore the earliest portions of the colonial era from the ground up. After rigging the sails for the Elizabeth II, helping a blacksmith carve their iron tools, or simply enjoying a spectacular open water view of Shallowbag Bay, you'll be happily lost in the world of the Outer Banks of centuries ago, and may never want to go back home. Call 252-475-1500 for current hours.